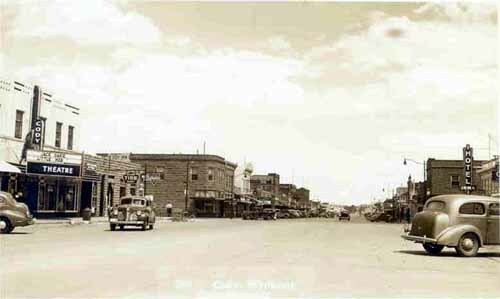 Top image: Cody Wyoming sometime around 1948. I never got started on the Cody branch of the layout. 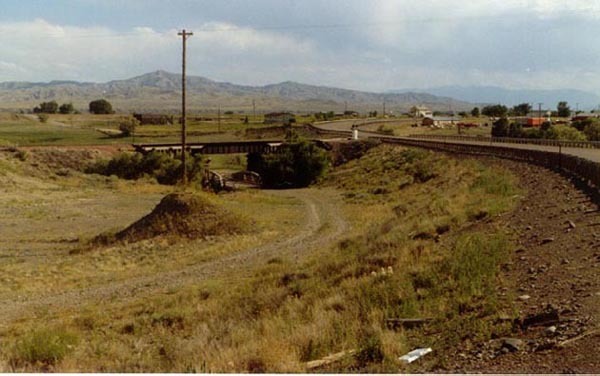 It was planned to take off of at Frannie, run through Powell and possibly Vocation, then on to the end of the branch at Cody, where the major customer of the railroad was the Husky Refinery. 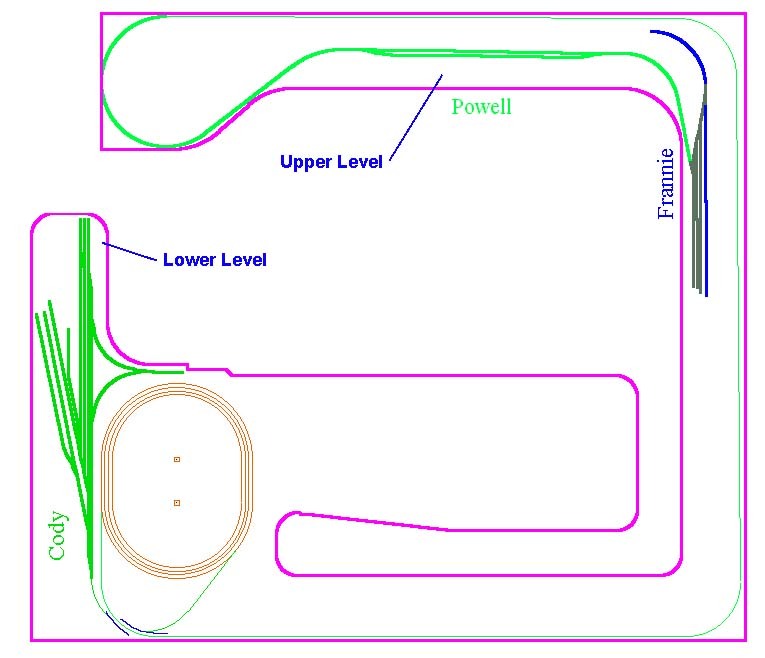 While it shows Cody on the lower level, actually Cody is a couple of turns up the helix from the lower level - about 8 inches higher than the base of the helix. Powell. Powell's primary industries are agriculture and oil, with agriculture the largest user of the railroad. Cody. Cody is (and always has been) one of Wyoming's resort towns. It major rail industry during the 1930s and 1940s was the Husky Oil refinery on the north side of the Shoshone river canyon. 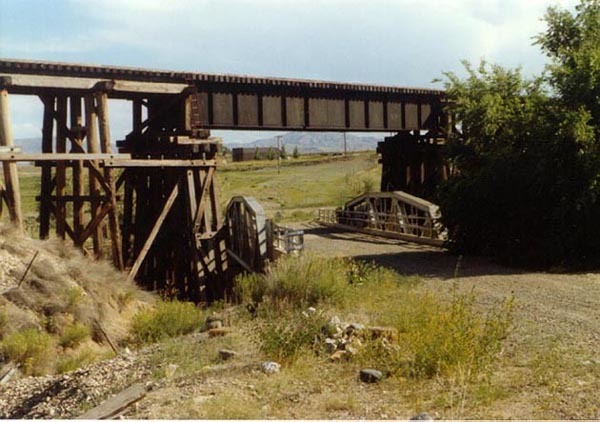 This is the bridge over Alkali Creek between Powell and Cody. This shot was taken in 1990. The bridge that runs under the railroad bridge in the middle of the shot was the old highway between Cody and Powell. The new highway can be seen to the right. 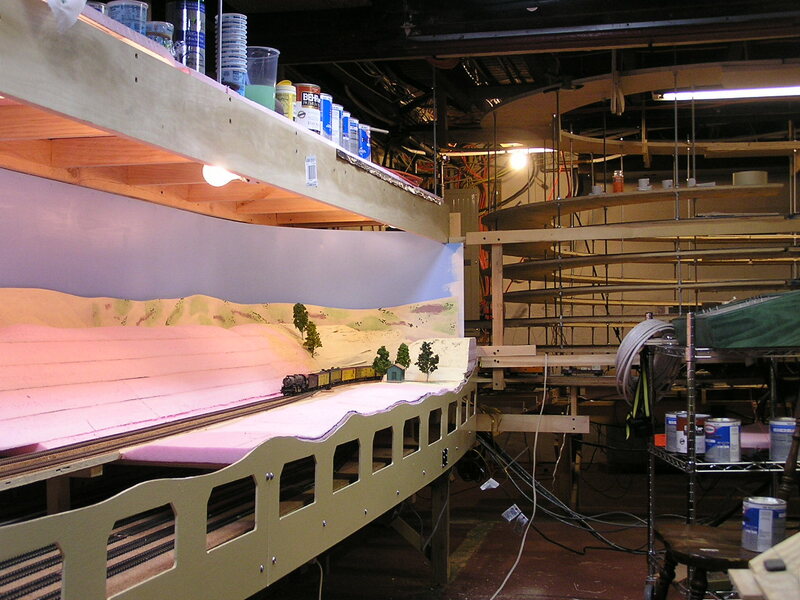 This is the second of the two primary scenery items (aside from towns) I'm including on the layout. One of my favorite early childhood memories was crossing under the railroad here. Here's a closer view of the stacked bridges. A scenic view of the Shoshone River between Cody and Powell. Photo courtesy of Northwest College, Powell Wyoming. These two photos show a geologic formation near Powell called "The Bench," which was once one of the largest producing oil fields in the world, conveniently in the era I'm modeling. Much, but certainly not all, of the oil produced here was refined in Cody. The field still produces oil, to which the pump in the right photo attests, but the field is only a shadow of it's former self these days. These two photos courtesy of Northwest College, Powell Wyoming.